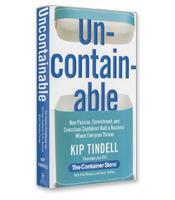 In Uncontainable, Tindell (Chairman & CEO of The Container Store) reveals his approach for building a business where everyone associated with it thrives through embodying the tenets of Conscious Capitalism. Tindell's 7 Foundation Principles are the roadmap that drives everyone at The Container Store to achieve the goals of the company. The book shows how other businesses can adapt this approach toward what Tindell calls the most profitable, sustainable and fun way of doing business. “The coolest part,” writes The Container Store founder Kip Tindell in his book Uncontainable, “is when you’re doing a performance review and give an employee a much bigger raise than she was expecting. She starts crying, you start crying, and the magic spreads across the company, and out into the world.” This short passage about compensation reflects the heart of Tindell’s philosophy of “conscious capitalism” in which the best way to make money is to do the right thing by employees, customers and the community. How do you translate a concept such as “yumminess” into a business model and real-world business practices? The answer, according to Tindell, is found in The Container Store’s Foundation Principles. What stands out in these principles is the unwavering and unapologetic embrace of being kind, generous and even sentimental, of believing that there is good in everyone and that by building on that good, you create a money-making venture. Uncontainable is a respectful (Tindell believes in not saying anything if you can’t say anything kind) but firm rejection of Jack Welch and Milton Friedman. 1. 1 Great Person = 3 Good People. The Container Store does everything it can to hire the best people, including compensating them at significantly higher rates than the average in retail. With his company consistently chosen as a Best Place to Work in America and boasting a turnover rate of 10 percent (the retail industry average is 100 percent), Tindell proves that his company is filled with truly great people. 2. Fill the Other Guy’s Basket to the Brim. Making Money Then Becomes an Easy Proposition. This principle is reflected, for example, in the company’s win-win relationships with suppliers, who are treated as partners. In fact, Tindell writes, good relationships with suppliers are win-win-win relationships because the customer also wins. 3. Man in the Desert Selling. Don’t just give the man in the desert a glass of water. Tend to all of his needs. Don’t sell a box. Sell solutions to the customer’s living needs. 5. The Best Selection, Service and Price. Most businesses will not attempt to achieve all three. “We work to hit the Triple Crown every day,” writes Tindell. 6. Intuition Does Not Come to an Unprepared Mind. You Need to Train Before It Happens. The average length of training in the retail industry is eight hours. In their first year, employees of The Container Store receive 300 hours of training — and the training continues throughout their career. 7. Air of Excitement! When greeted by enthusiastic employees genuinely interested in helping customers resolve their organizing needs, those customers become just as enthusiastic, Tindell explains. Conscious capitalism is not always an easy sell, despite the do-good sentiment expressed in every form of corporate communication that emerges from a company’s PR machine. If there is a core lesson from Uncontainable, it is that truly conscious capitalism exists only if the CEO leads with his or her heart. Maybe most CEOs will never be comfortable using words such as “yummy” or sharing the tears of pleasure that come with a raise. 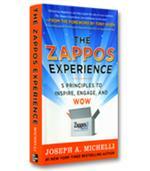 Not all CEOs can be Kip Tindell — but after reading this book, you’ll almost wish they could.